There were 683 press releases posted in the last 24 hours and 153,482 in the last 365 days. 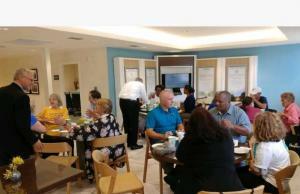 CLEARWATER, FLORIDA, USA, October 31, 2018 /EINPresswire.com/ -- On the 30th of October the Clearwater Community Volunteers Center held its monthly Charity Networking Luncheon for Tampa Bay nonprofits to network and form new partnerships. The luncheon was the most diverse to date with 13 different nonprofits in attendance whose activities vary from disaster preparedness, environmental restoration, to educating children.